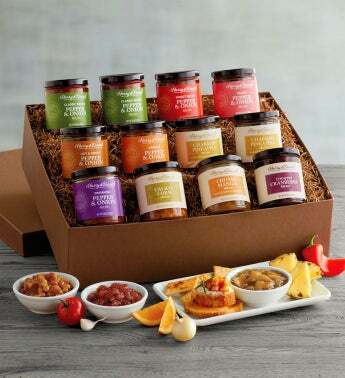 Part of a specialty line of gourmet gifts, our Deluxe Favorite Relish Box holds a dozen of our top-selling relishes. It includes classics like charred pineapple relish and some flavors with even more interesting twists, like zinfandel pepper and onion relish, hot and smoky spicy relish, and peach pepper and onion relish. The gift arrives in a distinctive gift box.